The organization of Small and Medium Enterprises in construction in Viet Nam is very simple, with a maximum of 10 office personnel including administrator, engineer, accountant or human resources. Some functions have no people to do it while some people have to do many jobs at the same time. The fact is that, SME could not hire good employees with low salary. The boss of SME usually is engineer or foreman, they are very good in their job but they didn’t have enough knowledge about business. They do the project base on their experience and learn from their fault. They have no project management process or the process is not useful. After one project, there are no people collecting data for the improvement of the next project. Some of management concepts like quality concept are not documented and analyzed. The small construction companies have limited resources, such as capital, labor, technical, experiences, etc, so they cannot run many projects at the same time or they cannot get big project. Le Hoai Viet made a study which objectives were to: (1) develop the checklist to identify the project management in practice of small construction enterprise; (2) use the checklist to investigate the selected companies in order to analyze the strengths and the weaknesses of the management in practice; and (3) propose recommendation for project management improvement. 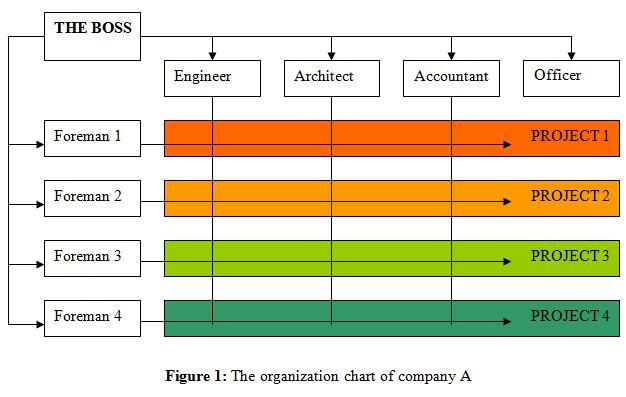 The tables 1-3 below indicate the strengths and weaknesses of the three companies in project management. Study suggests measures to improve the management process of the case study companies. Note that the proposal cannot be applied to other companies. Proposed organizational structure: All three companies should apply matrix organizational chart as shown in Figure below. Proposed costs management using WBS to divide and control costs. The company should focus to investment objectives to reduce indirect costs. Proposed time management: using Gantt charts. The company should determine the cause of delay to take measures to resolve and avoid repeating mistakes. Doing closeout process when project finish that is the basis for the next projects. Proposed quality management: to understand the definition of quality. Identify management is the key of quality control. Complete process of quality management and a commitment to comprehensive quality. Training for employees is the encourage solution. Procurement management: improve management of procurement processes, which emphasizes factors response time, quality and price. Company should use retail stores and philosophy “just in time”. In general, the management of construction projects not being narrow in scope of this study. 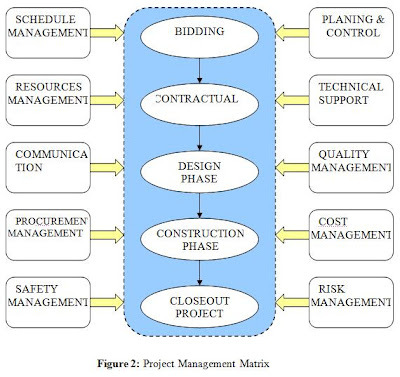 Management of construction projects has many functions and to perform regularly throughout the life cycle of the project. 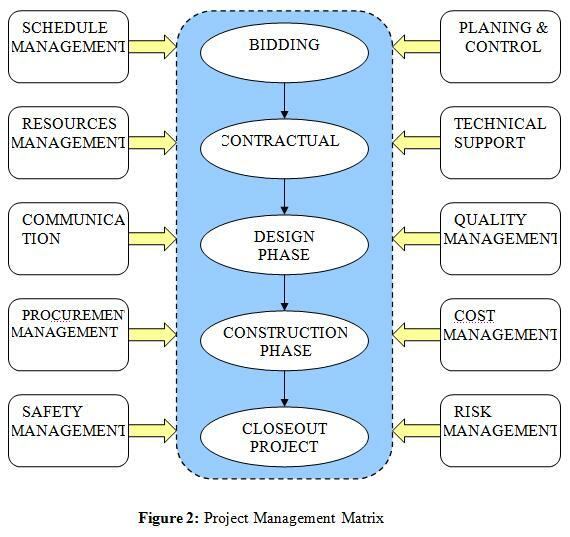 A matrix project management proposes in the following detailed description below. Major difficulty is the small construction companies have too little labor, so one must do many things at once. This study gives a general picture of project management, it is as a target for the boss strives to achieve. His thesis abstract is copied and posted. Subject of this study is to apply project management process to small and medium construction business. These enterprises are construction contractors established in about 5 to 7 years. They all stay in Ho Chi Minh City. The bosses are those who have long experience in the construction industry. Important part of this study is to develop a checklist to identify the process of project management of small businesses in practice. Research method is to use a checklist to interview business owners directly. The results obtained in the interview can indicate the strengths and weaknesses in project management of the business. The main function is interested in schedule management, cost management, quality management and procurement management. Process of project management of enterprises have more advantages can be developed for the better. Process can apply to other companies or vice versa. For the project management process is not effective, the study recommended improvements and changes and can be replaced with a more complete process. Every thing you are mentioned very clearly,good!